Jeremy just thankful for another opportunity: Click here. im really happy to see Jeremy to be given yet another chance to play in the NBA. Not everyone knows that he can really play at first, but once you see him in action you will see the real him. All he needs is a little bit of confidence in him, and he will shine. i told u he would go with #13. "i told u he would go with #13." lol, you sure called that! My guess would have been #77.
wow, the Rockets have a young roster. The only players with more than 3 yrs exp are Kevin Martin (7 yrs), Kyle Lowry (5), Luis Scola (4). 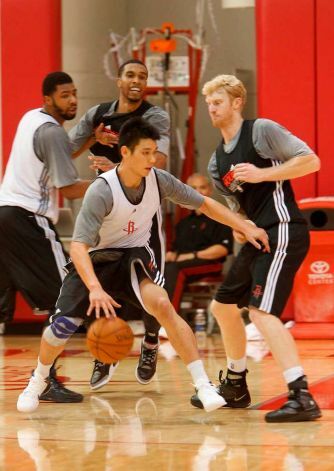 Looking at the Rockets roster, I think Lin has an uphill battle. The Rockets have 19-20 players on the training camp roster with 4 PGs. I think Lin can perform at a similar level as Dragic and Flynn. But remember that Houston traded away Aaron Brooks for Dragic, and traded away a 1st round pick for Flynn, whereas Lin was a waiver pickup. So unless Lin thoroughly outperforms either Dragic or Flynn, I would expect Houston to give Dragic and Flynn the tiebreaker based on what Houston gave up to acquire them. Yep, Rockets need to trade Dragic. Otherwise it's not looking good for Lin. I think the Rockets are willing to trade Dragic in their quest for a big man. McHale is defense minded and has enough offense from his other guards to keep Lin on in this role, especially since there's no effect on the salary cap. I like Dragic's game by the way. If Houston can't cut a deal with someone, I agree Lin becomes expendable. Wouldn't it be ironic though. The Warriors waived Lin so they could make offers that didn't work out. My take on Charles Jenkins is he's adequate on offense but a major liability on defense. He cannot stay in front of his man like Lin and looks like he's playing tag with players like Steph Curry. In other words, he is Acie Law 2. The W's will need to find a big PG who is defense minded who has proven he can play with the likes of Curry and Ellis. So if Lin is cut from Houston, I wonder if he has to be waived, or can he become a free agent which would be nice for him. Apparently Jeremy Lin picked #13. When is the Rockets' media day?